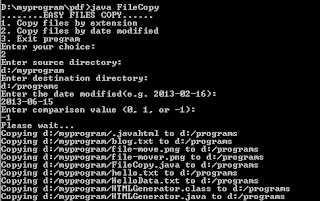 FileCopy is a simple program that can help you to copy files in your local computer from a source directory to a destination directory. There are two choices for you. You can copy files by extension. If you want to copy all files, write *. for the file extension. Another option is that you can copy files by date modified. If you want copy files that their date modified is equal to your date input, write 0 for comparison parameter. 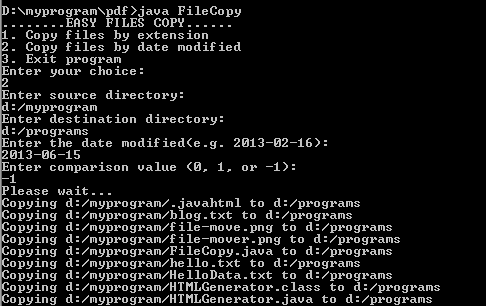 By writing -1 for the comparison parameter, files with dates modified greater than your date input are copied. In contrast, writing 1 for the comparison parameter is to copy files that have dates modifies less than the date input.